Tourism sites in Shama Apo, a fishing community in the Shama District of the Western Region has been abandoned by tourists . The community which used to be a tourist center in the District has now turned to be a danger zone for the locals, National and International tourist’s . This is making the residents poorer for no fault of theirs . Government’s inability to regulate mining and enforcement of the mining and fisheries laws in the previous years had imparted negatively on the Shama Apo Community. Illegal mining called Galamsey around the shoulders of river pra which take its source from Twifo Praso made the water unhygienic and therefore unwholesome to the public especially residents of the contagious communities. This problem has taken a National and International dimention. Water they say is colourless but the colour of the Pra river from about ten years now has turned “golden”. This polluted water meanders its way into the Ocean with Shama Apo being its entry point. Tourist are no longer patronizing the Shama Island to enjoy the breeze because of the unsafe nature of the sea water from the landing beach to the Island. Environmental and sanitation is not encouraging. The residents have one public latrine by the beach which is not enviromental friendly. Mr. Francis Kobbina is a member of the unit committee (arm of Government at the local level) He disclosed that the public latrine was built thirty years ago and it is now weak, so, residents fear of its collapse and they opted for open defecation at the beaches. “We wrote several letters to the authorities of the District Assembly but all proved futile” Mr. Kobbina remarked. The seater of the public latrine is soiled with human soil . It is not claar whether the unhygienic nature of the facility is making the locals to opt for open defecation or the cost involved. The care taker for the facility is seen eating infront of the facility with flies all over the food. She said, the community members pay 10 pesewas each time. Three out of five interviewed whether there was an outbreak of cholera in the Community, they said they were aware that some had had the disease and they were sent to Shama District hospital at Inchaban whiles others have been transferred to Effia Nkwanta. The Traditional authorities claimed they organise communal labour periodically to clean the shore, but carcass of dead animals, fish, rubbish and human soil were seen welcoming visitors with stenchy mood. In Mr. Francis Kobbina’s account, the mangrove which is supposed to serve as breeding place for the fish stock is being harvested as source of fire for fish smoking. The Natural habitat for local and migratory birds are also being distroyed and it is having a nagative effect on the tourism industry. 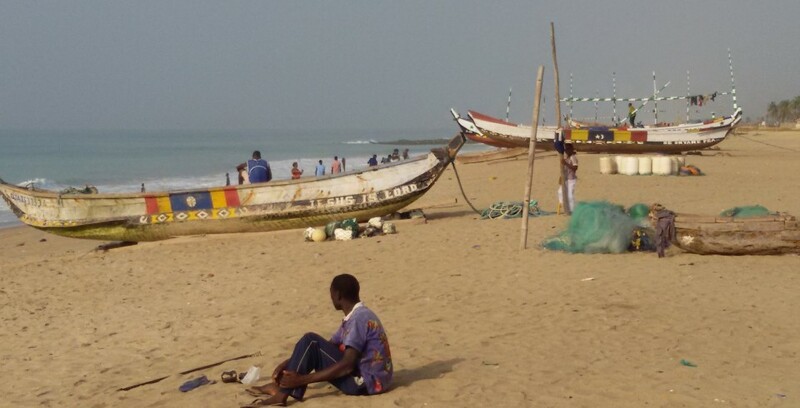 United States Agency for International Development USAID have been supporting University of Cape Coast fisheries and Aquatic science in addressing the coastal problems in building the fish stock. The project is also building capacity for the major stake holders in the fisheries and coastal management sector to be well informed about the issues to see how the challenges of the coastal communities can be addressed in a participatory and inclusive manner . During a capacity building workshop for sellected journalist across the four coastal Regions of Ghana for effective reportage, It came to light that, the Traditional authorities including the community members are aware of their problems but they dont want to take any responsibility. They have been appointing accusing fingers to the Duty bearers for doing little. Excellent write up there. However, could you please take out time to proof the article for grammatical errors? University of Cape Coast fisheries and coastal management (University of Cape Coast; Department of Fisheries and Aquatic Sciences; Centre for Coastal Management). These are three entities. please get it right.